As Benjamin Franklin once wrote, "An investment in knowledge pays the best interest." Millennial women would be wise to heed that advice because of the financial inflection point they currently find themselves in. Even though we are years from the financial crisis of 2009, millennials are still struggling with their finances, with fear of investing keeping them on the sidelines and real-life roadblocks making their retirement savings plans more challenging than they should be. As part of the POPSUGAR Insights 2017 Personal Finance Report, we surveyed nearly 2,000 women between the ages of 18 and 44 to ask them how they manage their finances and think about their financial future. 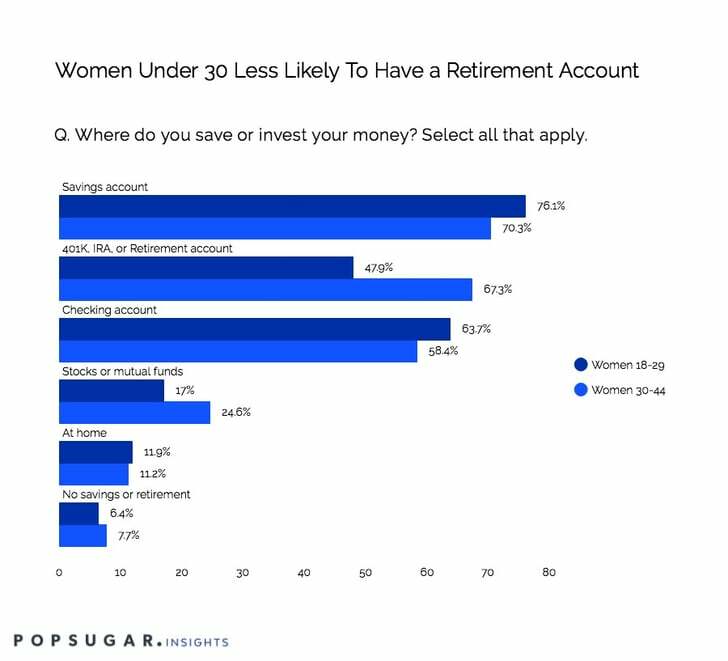 Overall, women under the age of 30 are 29% less likely to save or invest their money via a 401(k), IRA, or retirement account, but they're nearly 10% more likely to have a savings or checking account. While having a savings or checking account is a good start, it's important to make sure your money is working on your behalf. By not investing in retirement accounts, millennial women risk losing all the benefits of investing for the long term. An opportunity exists for brands to convey the importance of saving for both and later, and offer tips on how millennial women should balance thinking about the present as well as their financial future.